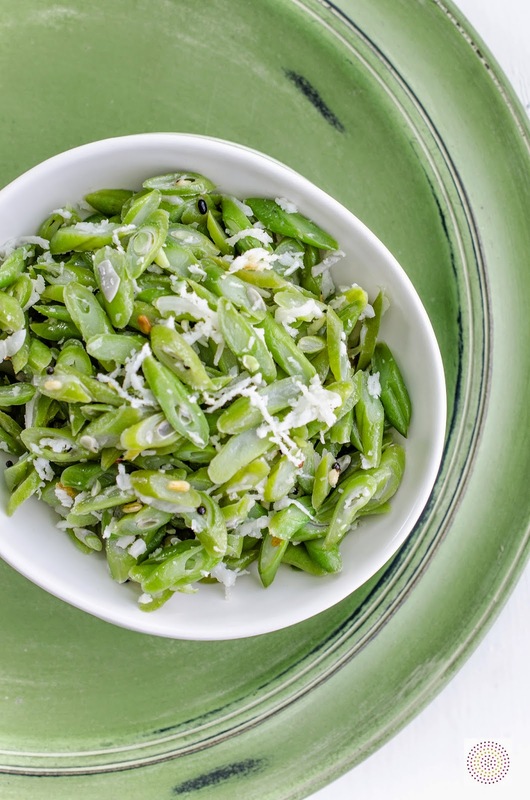 What do you do when your best friend shows up with a giant bag of fresh, crisp green beans from her garden? Well, first off, you give her a giant hug, cause everyone loves those beans. You then hand over the bag of beans to your mom and bat your eyelashes at her and ask her to make you the most delicious, super simple, vegetable comfort food of your childhood. I am lucky to have my mom visiting, and am aiming to make the best of having here here with me, even if it's for a short time. Us Mangaloreans are not known for our love of vegetables. Every meal, however, does include a vegetable or two, usually as the sidekick to a main of meat or fish. More often than not, vegetables are an afterthought, designed strictly as filler food. Even though half of India is vegetarian, simple steamed veggies - like you find here at almost every meal - are a rarity. Veggies are jazzed up with spices and sauces, and cooked to within an inch of their lives. The results are usually tasty, but, hey, where is the distinctive flavour of the greens? It took me a long time to appreciate the actual flavour of vegetables, as opposed to just dousing them in spicy sauces. And while I appreciate vegetable curry as much as the nest Indian, I also love a simple stir fry like this one. This dish literally takes just a few minutes to prep and cook, but the punch of flavour is out of this world. 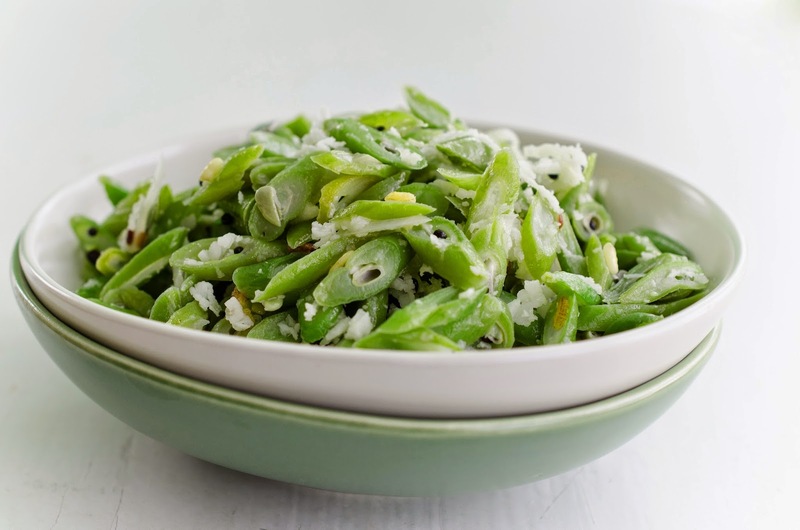 What I like best about this dish is that it allows the sweet, crisp taste of the fresh beans to shine through. The ingredients are super simple. A few mustard seeds, some garlic, a whisper of fried onions, some smoky curry leaves and the finishing touch, sweet, freshly grated coconut. This is a dish that evokes perfectly the coconut coast I grew up on, and every bite reminds me of home. Heat the oil in a large sauté pan, and add the curry leaves, mustard seeds, dal (if using) and garlic. Fry for a minute or two, until the garlic is fragrant. Add the onion and chili, and fry for a few more minutes, until the onion softens. Add the green beans, salt to taste and a splash of water. Cover and let the beans steam for a few minutes, until tender. Open the pan, stir everything together, taste, and adjust seasoning, if required. Stir in the grated coconut and serve with rice or roti. Luckily I've had a very good crop of beans from my neglected veg plot this year and so I'm very happy to have another way of cooking them. I'd never thought of adding coconut but it sounds perfect. Not for the first time in my life I am grateful to your mother for her fine cooking (and to you as well, of course). I've never been a big fan of green beans... I mean I'll eat them, but I don't really enjoy them. This recipe looks tasty though so I'll have to try it! Wow Fugath - are you East Indian? Oh Michelle. 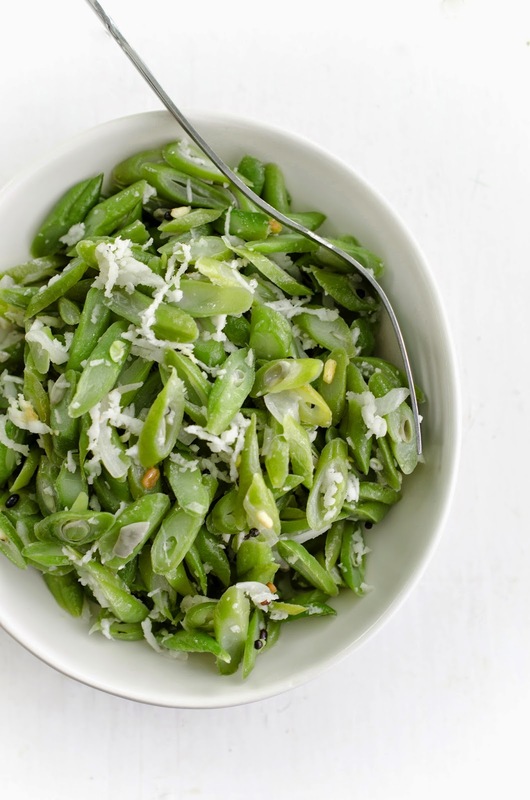 I love the simplicity of your green beans even though it took you a while to come around to the actual flavor of vegetables. Me? I live for em. And while I've never cooked with coconut oil before (I know right?? sacrilege for a real food blogger), your recipe (and story) inspires me. Dish me up girl! PS. You have the best friend and mother in the world. So great! I love how you cut your beans. It took me a while to warm up to the green bean revolution but I love them now! Great recipe!! I love the addition of coconut. It takes the dish I a whole new direction. Yum!